Wisdom of Life. : My nation 50 years of Independence. 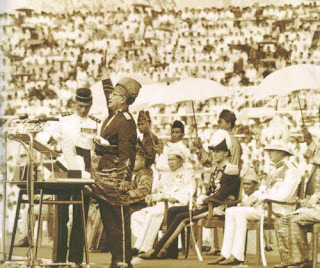 Today is our nation, Malaysia's 50 years of Independence. We have gone a long way and we are proud of our achievement in every aspect of life. We have gained much and also lost some of our past. In the pursuit of progress, we have acquired tremendous amount of knowledge in every direction. From agricultural base, we are at industrial base now and advancing into high tech related technology. In the pursuit of knowledge, I think we have lost the wisdom of understanding in simplicity of life. I can still remember those days when I was a little kid, our neighbour knew each other well. From one street corner to the other end, we knew each and every one of us. We shared and lived together like one big family. Although we were poorer and our life styles were simple, we never degraded and discriminated. During all festivals, we rest assured we were there to celebrate together. The harmony and kinship within us were beyond the admiration of the outside world. Today we are proud to have low illiteracy with most having a degree in hand. We are knowledgeable in mind and thinking, and we have higher expectation in life too. Of course it is good that we have reached this level of thought, but we have lost the simplicity of mind as well. Today, we tend to be more arrogance, impatience, unfriendly, discriminate and selfish in nature. My present neighbourhood is termed as higher middle class residents. Sad to say, we never mix at all. I don't even know the name of my next door neighbours. All our homes are built with higher retention walls which looked more like prison, rather than like a friendly home. If we ever happened to meet, instead of a smile, a hostile stare would be given. I wonder where all our wisdom of life has gone. Is this the side effect of progress and advancement? Or is it, too much of knowledge create self-esteem of the individual to loose the wisdom of thinking? Is scary but this is the true facts of life happening. Napolean Hill said, "Life reflects your own thoughts back to you."